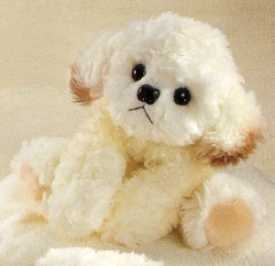 Stuffed Plush Bichon Frise - a very Special Keepsake! could melt the iceberg that sunk the Titanic. is definitely the Talk of the Stuffed Dog Show. would love to have you give him a good home. virtually hypo-allergenic. They hardly shed at all. The Bichon Frise has a moderate muzzle that isn't pointed. they can come in apricot, cream and gray coloring as well. muzzle and feet, or they can be show clipped like a poodle. clean cloth to avoid staining. all but you should brush out their fur daily. with us here online and tell all your friends about our site!